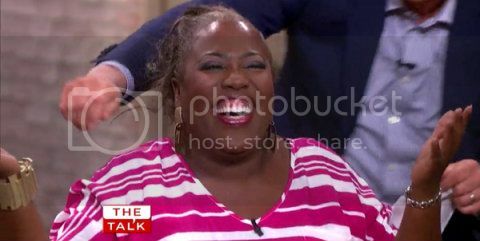 Last Friday during an encore presentation of CBS daytime chat show “The Talk,” comedian Sheryl Underwood inadvertently revealed just how she feels about the skin she's in during a discussion about supermodel Heidi Klum's decision to preserve her biracial children's hair trimmings after cuts. While Underwood continues her rant, the women at the table and the studio audience can be heard breaking into uproarious laughter. Black hair is disgusting! Isn't that hilarious? Underwood effortlessly demeaned black hair, which she described as “nappy” and “nasty,” while praising the “beautiful, silky” non-black texture. Meanwhile co-host Aisha Tyler chuckled tensely. Both Underwood and Tyler wear straightened hair. This fact alone does not necessarily provide insight into their consciousness as black women, but it certainly adds to the uncomfortable optics of seeing black women degrade blackness around a table of non-black women in front of an audience full of non-black women. Underwood trotted out her disdain for that which is naturally a part of her as part of a disheartening performance. Certainly laughter was the aim but the goal and the response are both telling and unsettling. With open embrace of natural textures, black women and men gradually break down societal stigmas about the hair that grows from their scalps. But truthfully we are far from a time when black hair can be seen simply as an adornment or accessory. As a former Grand Basileus of Black sorority Zeta Phi Beta, one might expect Underwood to champion fiercely the right of black women to exist in their choices unbothered. Instead she perpetuated a singular beauty standard that holds us hostage. But Sheryl Underwood is just one among many black women who have yet to embrace the full spectrum of black beauty. After the Oscars last year, fellow wig worshipper Wendy Williams criticized Viola Davis' choice to wear her natural hair on the red carpet because it wasn't “glamorous” enough. The pervasiveness of this mindset is a result of their self-perception being formed in a world that makes no attempt to hide its contempt for their black woman bodies from head to toe. Princeton University professor Imani Perry reminds us that comments like those made by Underwood reveal that black hair remains political. While some argue that Underwood should be dismissed because she represents the viewpoint of a “fake” black woman, I would venture to say that the majority of blacks reared in the clutches of white supremacy have yet to completely shake its bonds. Sheryl Underwood is a “real” black woman. Real black women continue to struggle with self acceptance. In this way, Underwood's words are understandable but not excusable. Watching Black women of all stripes comes together in defense of their own image is the most gratifying thing about these sorts of events. The natural sisters are joined by the relaxed and weaved to reject self hatred. Self-loathing will always exist in a society rooted in white supremacy, but social networks and blogs allow us the opportunity to push back immediately. Sheryl Underwood learned this weekend that no one can freely attack blackness with impunity.